...bought this many shoes at one time! 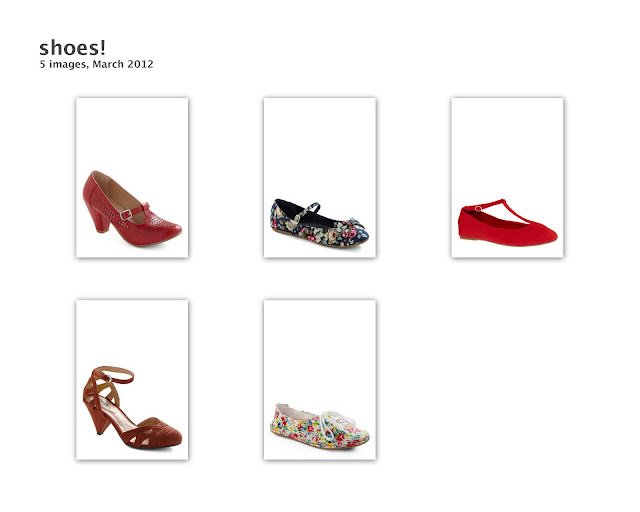 Yes, thats right, this morning I ordered five pairs of shoes from mod cloth. Since I got rid of basically half of my closet yesterday and only kept the things that fit and the things I love, I decided to treat myself to some new digs. I also ordered some clothes from Old Navy. Who knows, maybe one day I'll be brave enough to do an outfit post? I'm also thinking of doing a video blog at some point. I'm a bit nervous about it, mainly because I tried earlier this week and totally failed technology wise. But it may be something I'll do eventually. I love each pair of these shoes, but I think my favorite are the floral mary janes and the cinnamon color close-toed sandals..